A view of the micronuclei of Paramecium multimicronucleatum. The circumferential band cut in cross section in the upper nucleus looks like it is composed of a band of four microtubules. This band is cut tangentially in the nucleus to the left and may appear as three disbursed segments in the lower nucleus. 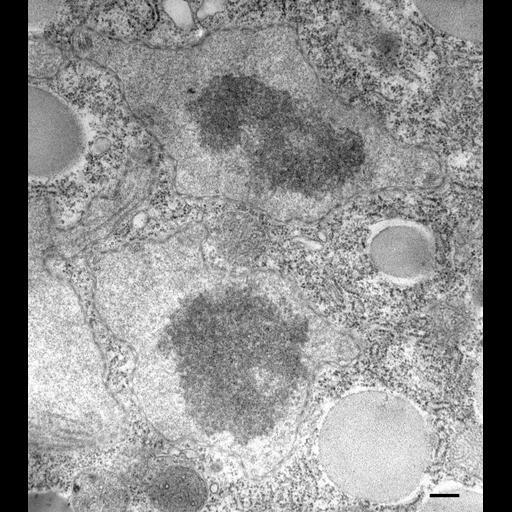 Whether these microtubules are remnants of previous mitotic events or are a constant feature of micronuclei is not known at this time. TEM taken on 3/18/81 by R. Allen with Hitachi HU11A operating at 75kV. Neg. 18,000X. Bar = 0.25µm.